Above: Picketers this morning near the main entrance of the Hopkins Hospital on Orleans Street. Johns Hopkins Hospital was ringed by more than a hundred employees this morning who are staging a three-day strike after a union representing food, service and maintenance workers failed to reach a wage agreement with the hospital. 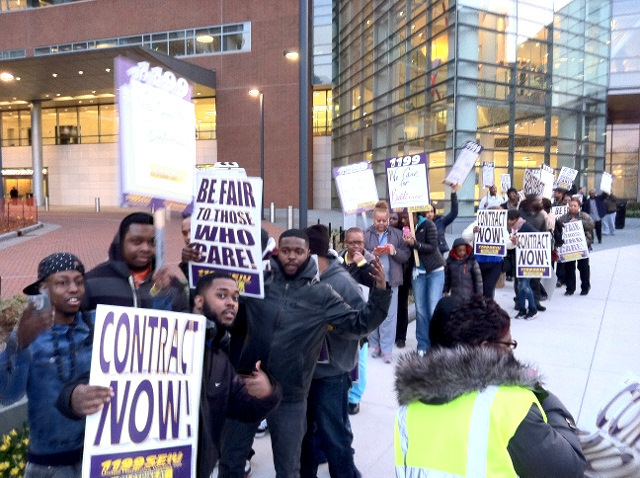 “The mood is jubilant and not at all rowdy,” Jim McNeill, a spokesman for 1199SEIU United Healthcare Workers East, said. Picket lines have been formed at the hospital’s main entrance at 1800 Orleans Street and on surrounding streets. More than 1,300 members have signed up for picket duties during the three-day strike, which will end at 6 p.m. Friday, McNeill said. The strike came after the union late yesterday rejected a wage offer by hospital management that it said amounted to annual raises that averaged less than 2%. 1199SEIU seeks to establish a $15-an-hour minimum wage for workers with at least 15 years experience over four years. Late yesterday, hospital management made offered a minimum wage of $12.25 an hour, which would take effect in 2018. Currently, many Hopkins workers rely on food stamps and Medicaid to supplement their “poverty pay at the nation’s No. 1 rated hospital,” according to McNeill.